Christians often speak about how the saviour, Jesus Christ, bled to save mankind from its sins. Whenever I come across that statement or hear it, my mind races back to the 11th of January, 1999. That is a day etched in my heart coupled with mixed emotions. It is a day whose memory makes me smile and cry at the same time. It is a day when dear Swami, Bhagawan Sri Sathya Sai Baba, bled so that His children could be happy. I had joined as a student of the XI class in 1998 and I was very excited about participating in my first ever Sports and Cultural Meet of the Sri Sathya Sai Institutions. Each passing day, my relationship with Swami was growing in different dimensions. Ever since that first memorable experience where He accepted my love, I looked forward to each event to add to my experience-bank. The Sports Meet is a time when the students from all the different campuses of the Institute - the Prasanthi Nilayam Campus and Puttaparthi, the Brindavan campus at Bangalore and the women�s campus at Anantapur - and the schools at Puttaparthi - Primary school and Higher secondary school - come together in an effort to please their dear Swami. The significance of the timing is very profound. It is the time of the Uttarayana or the northward movement of the sun. This is considered as a very auspicious time for contemplating on the Lord and it is said that such contemplation leads to oneness with the Lord. In fact, the grandsire in the Mahabharatha, Bheeshma, who had a boon that he could die only when he willed, decided to do so in this period of the Uttarayana. For the students studying in Swami�s schools, thinking of the Lord becomes an automatic affair as they plan and prepare in full gusto for the Sports Meet. As Sami puts it, this is a time when the students bend the body in an attempt to mend the mind and end the senses. "This body has come for the sake of devotees and shall be utilised for doing anything and everything for their welfare." - Baba... Picture of Swami descending the steps to move towards the assembled students on the ground. I remember that day very vividly. As soon as Swami arrived at the Sri Sathya Sai Vidyagiri stadium, a grand and beautiful music filled the stadium. (This was a theme song from a famous movie that had been just released then.) I was seated near the Shanti Vedika, the stage on which Swami would ascend. I was about a good 150 meters away when Swami�s chariot entered the ground. I could feel the electric waves of excitement flowing through the atmosphere. A grand welcome had been planned and the whole procession flagged off in a happy and holy manner at His arrival. I began to focus through my 200mm Tamron lens mounted on the Nikon 801s. Even through the zoom lens, Swami was only an orange speck in the frame. As the chariot moved on, Swami did something that cheered the entire crowd - He stood up in the chariot so that all could see Him properly. Immediately, He became a bigger orange blob in my viewfinder also. I was just focusing and refocusing waiting for Him to fill at least more than one thirds of the frame before I could start exposing the Kodak 200 ISO film that nestled inside. I was just watching and suddenly something terrible happened! Swami seemed to trip over or something like that and in an instant, the lovable orange figure vanished completely from my viewfinder! I immediately put the camera down and trained my eyes to see what was happening. The chariot had come to a halt but the procession was still moving on, merrily. I understood one dimension of how ignorance could be bliss. Before any worry could envelop the stadium, Swami got up and stood again in the chariot. He was smiling and waving to the crowd as before. I heaved a sigh of relief and picked up the camera, shooting away. The Sports Meet moved ahead with the opening ceremony and the presentations by the various campuses and schools. It was held in two separate sessions - the morning session for two hours and the evening one for two hours. 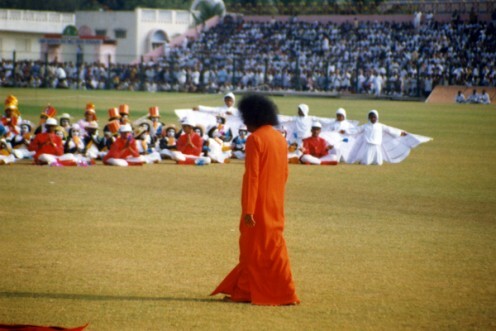 The highlight was when Swami moved down the stage and walked to the field for five times to pose for photographs with the student-performers of the day. There is a reason why I seem to be fast-forwarding all the action of the Sports Meet. I shall return to the events of the day after making a brief visit to the 14th of January, 1999. It was Makara Sankranthi, the day when the sun actually starts its ascent which is also the day of the prize distribution in Prasanthi Nilayam. That day has held special meaning for me for many reasons. For one, it was on this day that Swami taught me how to walk! But that exciting story is part of another hub. Swami arrived for darshan and completed the prize distribution ceremony. Before Swami�s discourse, there was a talk by the then warden of the Brindavan campus, Sri.B.N.Narasimhamurthy. Even as he came to the podium, he seemed to be sort of overwhelmed. His speech was strange, so to say, in terms of its contents. On such a happy occasion, he began to recollect instances where Swami had taken on the sufferings of His devotees on various occasions. Now let us revisit the 11th of January 1999. Swami had suffered deep gashes on his back, head and hand. But immediately, He had �risen to the occasion� and continued as if nothing had happened. He had continued to the stage and lit the lamp and started the proceedings. Though there was excruciating pain, He had not cared - body attachment is a human quality not of the divine. It was a miracle in itself that no part of the robe had torn. It was as if it was sharing His divinity. Then came the part which any human would have found impossible to bear - to sit through the whole session of about 2 hours in such a bleeding and injured state. We had seen Swami get up and move backstage very frequently. He did this to wash away the blood so that nobody noticed. Again, there are students who maintain Swami�s room. Lest they discover about the bleeding, Swami washed by hand the towels which were blood-stained! And He did this not once or twice but for more than 5-6 times throughout the session. Two students moved to Swami and requested Him to hoist the flag. That meant another journey of 50 meters or so and He did it with a smile. The toughest parts were when each campus completed the presentation and requested Swami to come down to the ground and grant �family photographs�! Shocks of pain must have shot through Swami�s body but He hid it all so well. Calmly, He moved down for about five times, posing with the children. Oh! How bad I felt for being part of the huge group that prayed for Swami to come down! Many times, our prayers are like that. Having no idea of the past or future, we make our requests and prayers. And when they get answered, we feel that our prayers could have been different! The discourse revealed the reasons for the Divine fall. 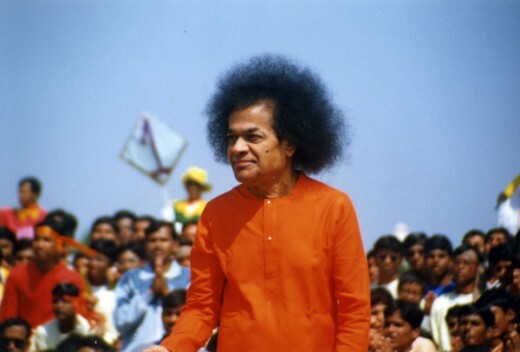 Knowing the past, present and future, Swami had advised the students from the Brindavan campus not to come to Puttaparthi for the Sports Meet. This was a shocker. They prayed and pleaded to Swami to let them come. After much ado, Swami agreed that they could come and perform. However, the stunts being performed had been chosen by destiny to deliver some fatal blows. One student had already fallen during the practice sessions and had incurred a serious injury to the spine. The first opinion of the doctor who examined him was that the boy would not be able to sit or stand in his life again. Swami sent vibhuti and advised that he should be taken to Bangalore. By the time they reached the hospital, the boy was already sitting! The mercy and love of the Lord brought him out of spinal fractures in miraculous time. And now, destiny had planned another blow. To avert this disaster and in order to teach everyone the consequences of not listening to Him, Swami decided to take that blow on to His own body. He had silently bled and suffered the pain. But not for a single moment did the pain show on His face. It was an example for all humanity. And now tell me, when it is said that Christ bled to save mankind, how can I not remember Swami? His body was like a candle that burned away to provide light for others - a life of great sacrifice.